T Nuts are also known as tee nuts and blind nuts. Our t-nuts are designed to accept a course thread machine screw. T-nuts leave a nice flat surface for fastening wood, sheet rock, particle and composite board. 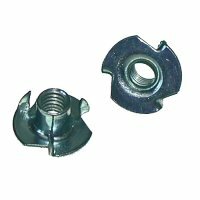 Our 3 pronged tee nuts should be pounded into your working surface which will prevent slipping of the nut and provide a secure surface connection.